Nowadays most manufacturers are trying to present cell phones with big screen size and this is creating a big competition between them. In this competition, smaller sized cell phones or are really neglected by both manufacturers and buyers. However, if you are a small cellphone lover, then here is a news that’s totally for you. Yes, a company under branding of Zanco came with a world’s smallest cellphone. It is so tiny that you will find it unreal in first impression. 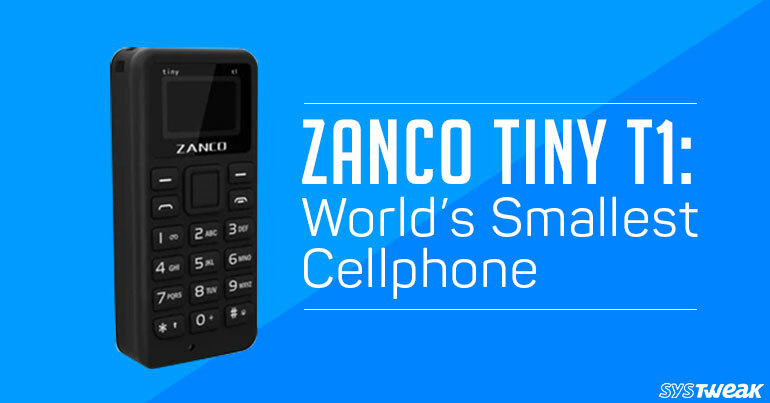 Zanco has officially introduced a cellphone which is named as Tiny T1. As its name suggests it is smallest cell phone in the world with the length size of just 46.7mm. Also by design it appeared really good and it is even lighter than a coin i.e. 13 grams. Since it is so small, you cannot expect high end specifications like smartphones. But, the available specifications are also not bad. As per the Zanco, this device will support any cell phone network but only on 2G bands. It supports single nano-SIM, so to switch to other network provider, you will have to change the sim every time. Now if talk about the battery, you will find it really good as it has 200mAh battery which will give 3 days standby and 180 minutes of talktime. Dimensions are the main attraction of this device which is unbelievable i.e. 46.7mm L x 21mm W x 12mm Thick. Motherboard used in this phone is provided by Mediatek (MTK6261D) which is a well known manufacturer of cell phone processors or chipsets. Screen type used is OLED with size of 0.49 inch under the resolution of 64×32, which is sufficient to see the dialing number or read SMS. If you look to its phonebook, then you will come to know that it can store about 300 contacts and also it can store 50 SMS. Last but not least it also supports ringtone Profiles, which you can set at per your choice at different places. Due to small size, it will provide main basic features which a cell phone should have i.e. Calling and Messaging. As mentioned above it only supports 2G network, which can work on 2 band frequencies i.e. 850/1900 and 900/1800, therefore, this device can be used in almost every country which have 2G network available. Charging port used in this device is Micro USB and Microphone is placed just near it. You will get fully functional keyboard to make calls and send messages with white backlight. Also, this device can be attached with the Lanyard. Only supports 2G network: As per its size this factor can be neglected but if any country do not have 2G network or they have upgraded to 3G network and above, then this device is not useful. Technology is getting improved day by day, however, at this stage providing a 2G based cell phone is really a bold decision.